We were in London from the 25th March 2017 to the 30th March 2017. The journey began on the 25th March 2017 at 7:45 am. The meeting place was the bus stop at the second schoolyard. As everybody was there, the bus started to drive. It was about 8 am. We drove through Germany, the Netherlands, Belgium and France. In Belgium we made a 15 minutes break because it was really exhausting to sit on the seat and do absolutely nothing. Until Belgium the journey already took about 5 hours. The next break we made on the ferry in France. The bus parked in a parking hall on the ferry and the students went to the top of the ferry. About 2 hours later, at 6pm the ferry arrived in England. The journey from the ferry to our hostel in London took a further 3 hours. When we arrived in our hostel it was about 8 pm. The students were very tired because it was a long and exhausting journey. But all in all it was a nice journey. The bus driver was nice, the students were quiet most of the time and there was no trouble on the way. After we had checked in to our hostel and unpacked our suitcases, we met the teachers down in the hall. They told us, that we could go to the city centre and buy some food. At 10 pm we went back to our hostel and went straight to bed because it was a very exhausting day and we were too tired to do something else. 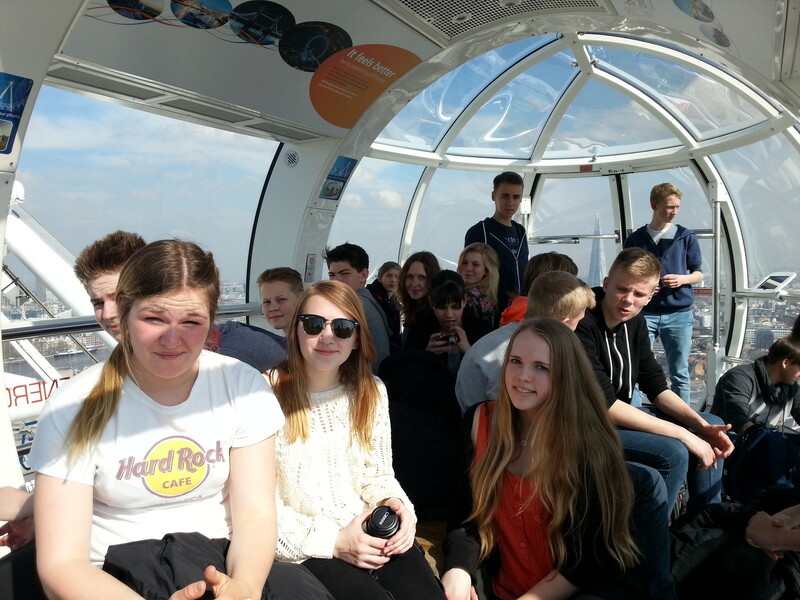 We started our first day in London with visiting the London eye. 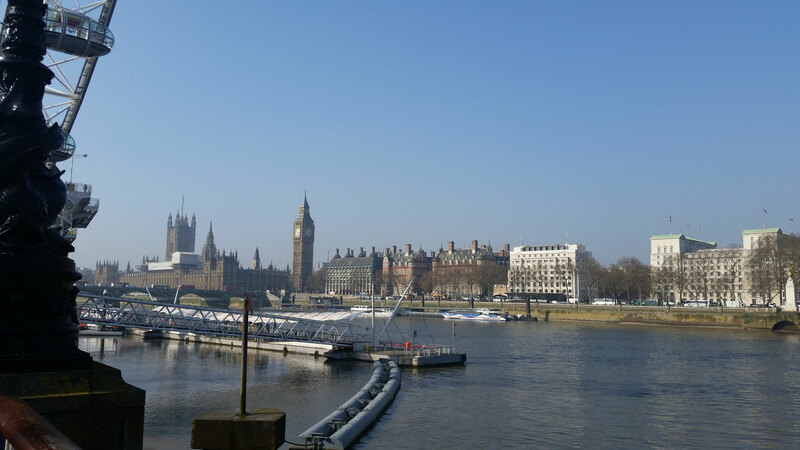 We took the tube to get to the famous wheel and then walked to The Houses of Parliament. From across the river we had a fantastic view on the golden building and the tower of Big Ben. Everyone used that opportunity to take a few amazing pictures. 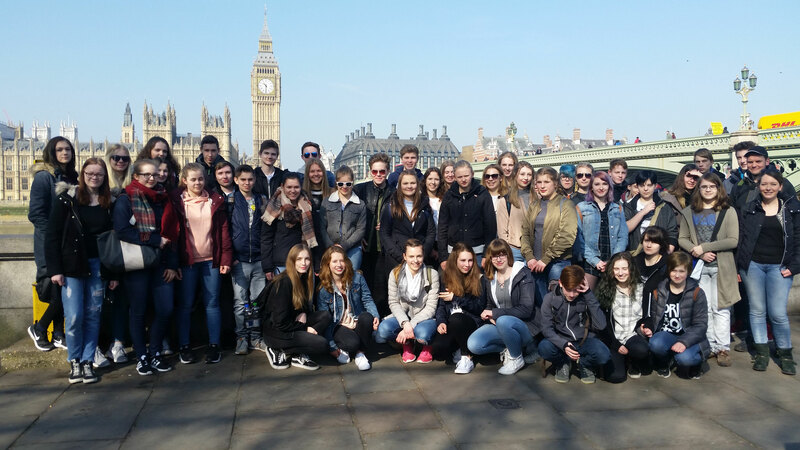 After that we crossed Westminster Bridge to get to Westminster Abbey and continued our walk towards Buckingham Palace. From there we took the tube to get to Camden market. The weather was sunny and warm, so it was the perfect weather for a day in Camden. It was a really great day with a lot of new impressions from different cultures. The Camden market is a huge area of London’s city center, nearby Westminster. It is famous for its little shops, big food markets and amazing market halls. When we arrived in Camden, we went with our small groups through this area of London and had time to explore it a little on our own. It was a lot of fun to discover the different streets and the buildings there with our group members. Camden is a very beautiful and interesting part of London because everywhere are little shops with amazing gifts, clothes and other interesting things that you can buy. At the end of the “Camden road”, the main road, was the begin of the food market with a lot of different restaurants. The restaurants that were situated there weren’t very expensive. So we bought a lot of differentt dishes from different cultures. Food from all over the world was sold there and it smelled incredibly good. And it also tasted very good and delicious. Many of us bought souvenirs like postcards or cups with photos of Camden for their families or themselves. All of us enjoyed the day in this very crazy but beautiful area of London. It was an exciting day that we will never forget in our lives. We can only advise everyone to take part in the London trip and to have the chance to discover Camden. We woke up very early at half past five, because we had to get ready for this day at quarter past six. At 7 o´clock we drove to Icknield High School in Luton. At half past eight we entered the school and met the English students. Then we sat down in the canteen. A teacher and the mayor holding a little speech welcomed us. Then every student got an English exchange students. The pairs had to sit down next to each other. I was very lucky to meet Sana, a really nice girl. After that we had breakfast with our English students. After breakfast we went with our English students to their lessons, a bit of German, design, technology, chemistry, English and textiles. We also got a break and went to the canteen to take our lunch. The school ended at 3 pm. 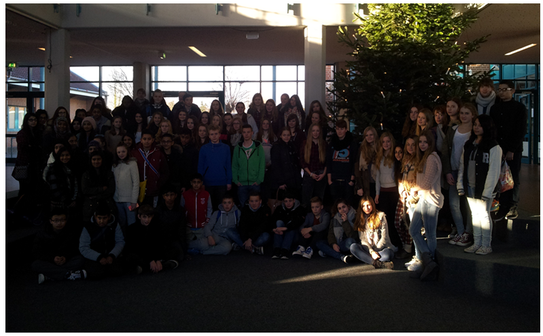 We all came together in the hall and said goodbye to the English students, but we didn´t forget to take a photo. Then we drove to the city of Luton where we could do a little shopping. In the evening we stayed at our hostel. 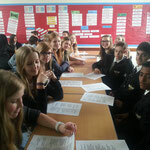 All in all, visiting Icknield High School was a great way to practice our English and we all had great fun with the students. In the morning we had to bring our suitcases to the bus. Then we walked to the Natural History Museum but we couldn´t go inside because we would have to wait in the queue for more than 30 minutes. Because of that we went to the next tube station and drove to Tower Hill. At Tower Hill we went to the Tower of London and to the Tower Bridge. We had a fantastic view there! 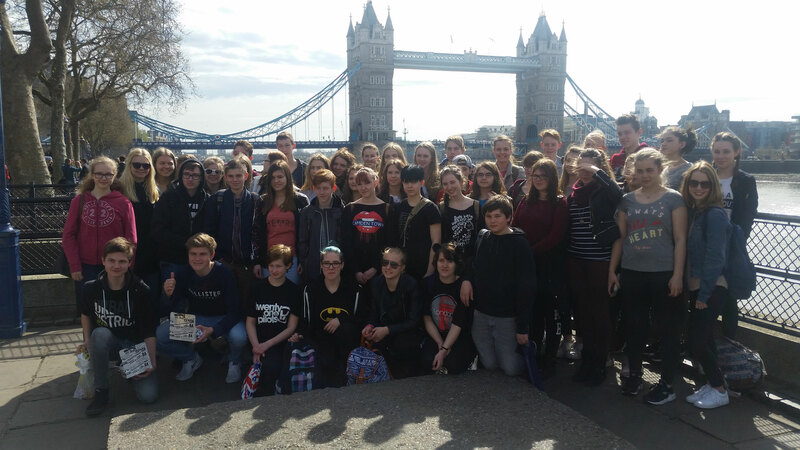 After we walked across the Tower Bridge we walked along the Thames. 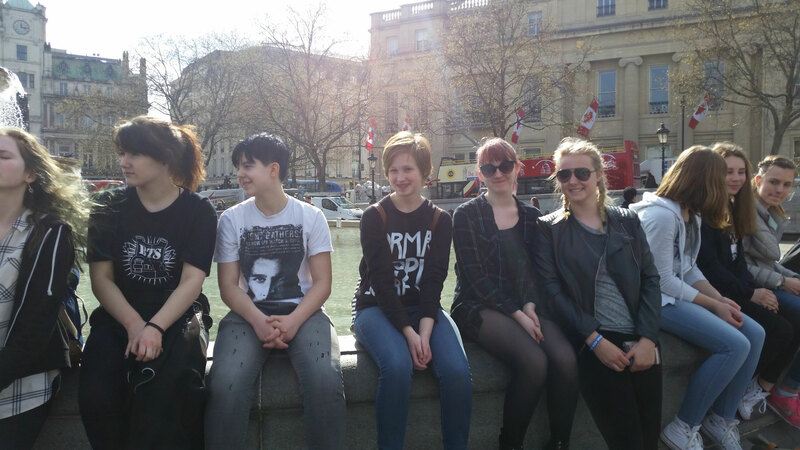 We were very happy because we had very nice weather and could explore London. After some time we saw the Shakespeare Theater. It looks like an old house from the time of Shakespeare. Then we walked to St. Paul´s Cathedral. The Cathedral is very high and it was very interesting to see the Cathedral, unfortunately we couldn´t go inside. It was a very impressive walk through London though. After we had seen the Cathedral we made a break because it was also very hard to walk for a long time. But the pain was worth it, because London is a really fantastic and beautiful city. After the break we had some free time and wanted to go to the next tube station. From the tube station we drove to the Camden Market and went shopping. Camden market is very good for shopping and you can also eat delicious very delicious food from all countries there. Later we went to the tube station again and drove to Earls Court because we had to go to our bus and to get home. We were very sad that we already had to go home because London is a fantastic city. At the bus we met all the other students from our project. Then we drove home. After three hours we arrived at the ferry port and went on the ferry. We had to stay for about 2 hours on the ferry and arrived at the ferry port in France. Then it took us about 6 hours to go home and we arrived in Olfen at about 7am. 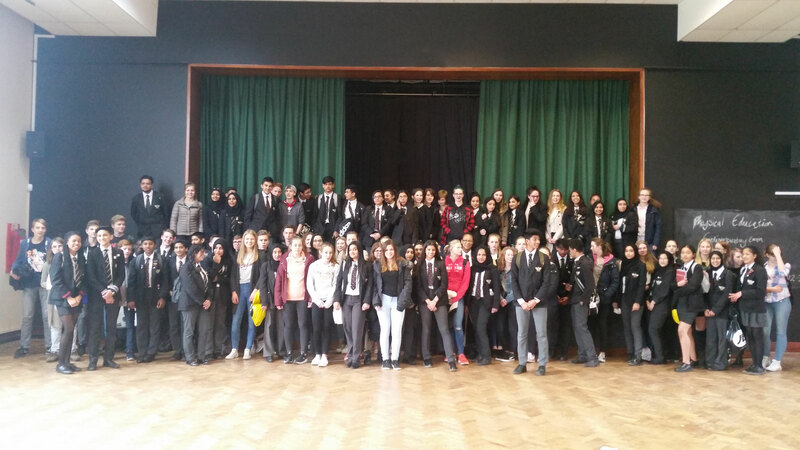 Bereits zum dritten Mal besuchten uns am Mittwoch Schülerinnen und Schüler unserer befreundeten Schule in Luton, England, um mit den Profilprojekten in der Stufe 9 einen schönen Tag zu verbringen. Nach einer strapaziösen Anreise mit Bus und Fähre erreichten uns Mittwochmorgen um 9 Uhr 33 müde, aber gut gelaunte englische Schüler, die nach einem reichhaltigen Frühstück von unseren Englisch-Profis aus den neunten Klassen begrüßt und anschließend in das Schulleben eingeführt wurden. Es wurden in kleinen Gruppen Schulführungen und eine Stadtführung organisiert. Außerdem durften die Gäste in der 3. und 4. Stunde am Unterricht verschiedener Klassen und Kurse teilnehmen. Nach einem anstrengenden, aber spannenden Programm erfolgte die (eigentlich viel zu frühe) Abreise am Nachmittag in Richtung Köln. Es wurde viel geredet und gelacht, Nummern und Mailadressen wurden ausgetauscht, der Abschied war herzlich. Unsere englischen Gäste freuen sich darauf, die Kinder aus den Profilprojekten im kommenden März als Gäste in Luton begrüßen zu dürfen. Es zeigte sich im Nachhinein erneut, wie gewinnbringend ein solcher Besuch für unsere SchülerInnen ist. Sie lernen außerhalb des "herkömmlichen" Unterrichts, ihre Sprachkenntnisse anzuwenden und erkennen besonders bei solchen Treffen mit fremdsprachlichen Kindern, wie gut sie tatsächlich bereits die englische Sprache beherrschen. Hochmotiviert sehen die Projektkurse somit der folgenden Exkursion nach London und Luton entgegen. Our trip started in Olfen at 11pm on Monday. We got on the coach to go to the capital of England – London. The journey took about eleven hours. It was long, but we were able to sleep a little. Early in the morning we arrived at Calais where we took the shuttle train to cross the ocean. At 7am we arrived in England. After an hour we got into London where we saw the first special sight of this amazing city: the rush hour. It was interesting to see the British people going to work. 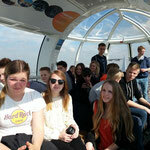 We also had a first view on the River Thames and the London Eye. We got off the coach and then crossed the river to have a small breakfast at the place with the golden M. One hour later we started our sightseeing tour. 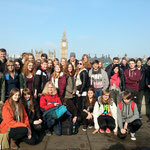 First we went to Big Ben and the Houses of Parliaments where we listened to presentations by our classmates. After that we went to Westminster Abbey where Prince William and Kate married a few years ago. Next we went for a nice walk through the parks in front of Buckingham Palace. There we met many gray squirrels and other fascinating animals like pelicans, geese and ducks. After we had taken many pictures and followed interesting presentations about Buckingham Palace we walked along the Mall and stopped to entertain the Royal Guards. We tried to make them laugh and a few of us danced the Macarena, but they did not laugh. 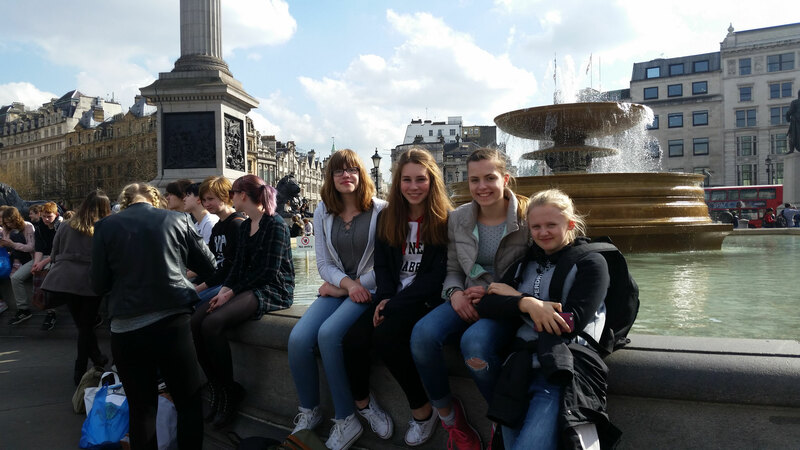 So we went on to Trafalgar, Leicester Square and Piccadilly Circus. There we stopped our sightseeing tour and got some free time. 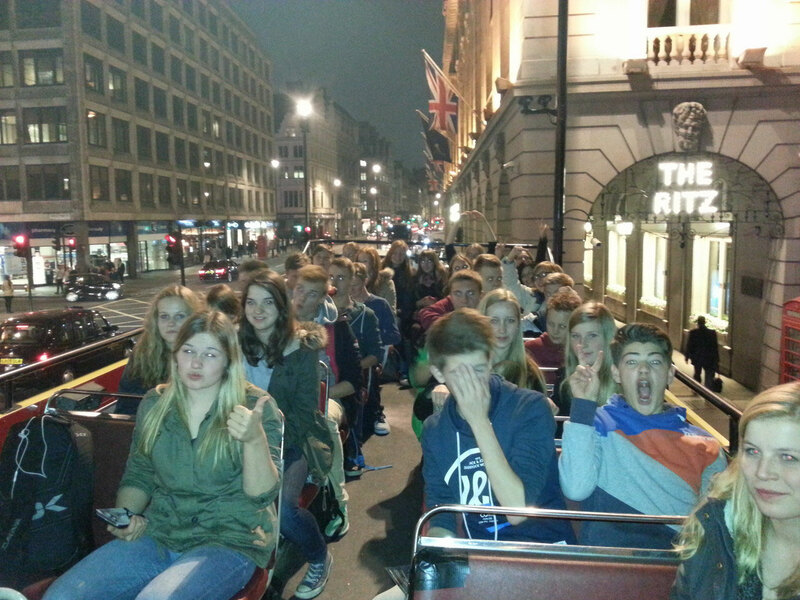 Our group went shopping to Oxford Street. After a few hours we met again and went to the London Eye. We had a beautiful view over London from there. After that we could do something in our groups again, before we met at 6.30pm at Bayswater Station (almost everyone was on time) to get on the coach to Luton. At 8 o’clock we arrived at our hotel. Everybody was tired and quickly fell asleep. The day began at 7.30. 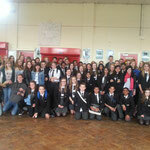 Everybody got on our coach and we went to the Icknield High School in Luton. 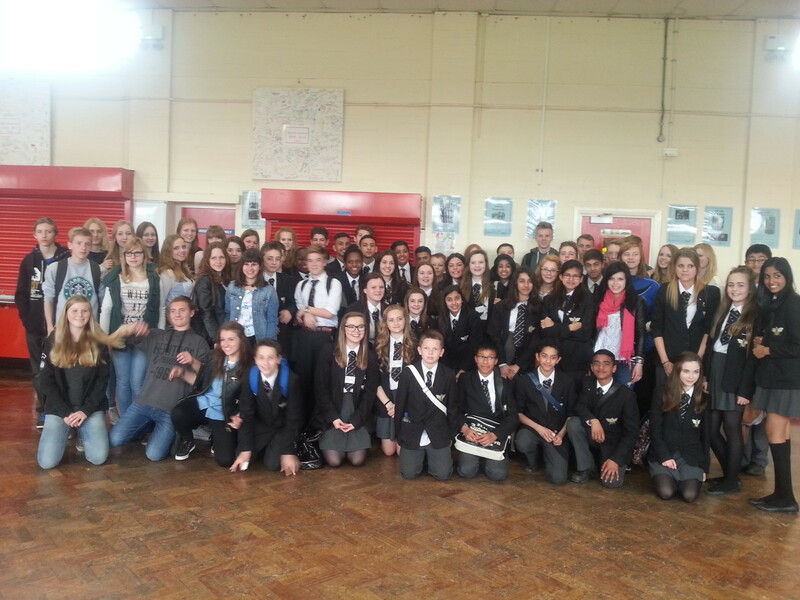 There the pupils and teachers welcomed us and we met our exchange partners. We had breakfast and talked to our partners. After that we went to different lessons. The floors were full of pupils in black uniforms. We went through the floors and everybody looked at us, because of our colourful clothes and everybody wanted to speak with us. We were the attraction! Our group had music first. There we had to perform Demons – a song from the Imagine Dragons. It was very funny, because Fred played the key board while another boy sang the song. In the first break we played football with our exchange partners and other English pupils. After the break we had geography and maths. We taught our exchange partners German words. Then we had lunch and another break. 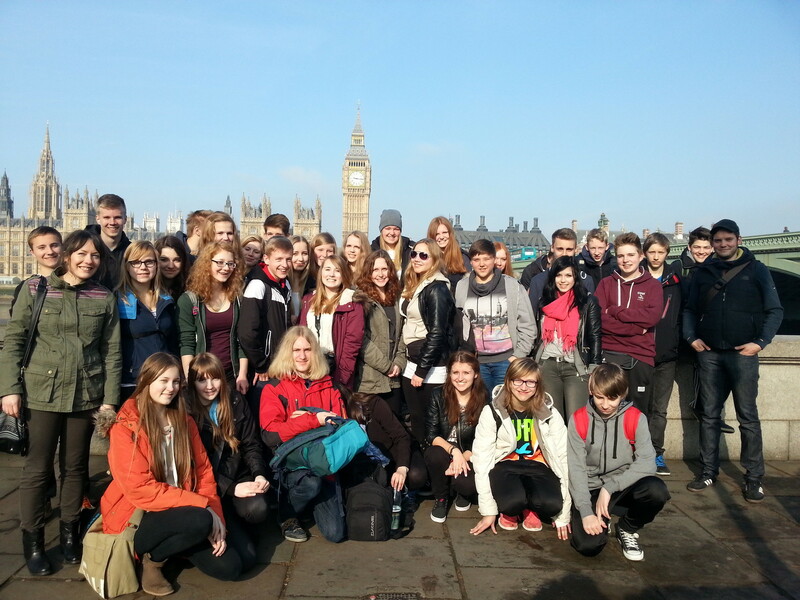 The English pupils wanted to make “Selfies” with us and tried to speak German. That sounded very funny. 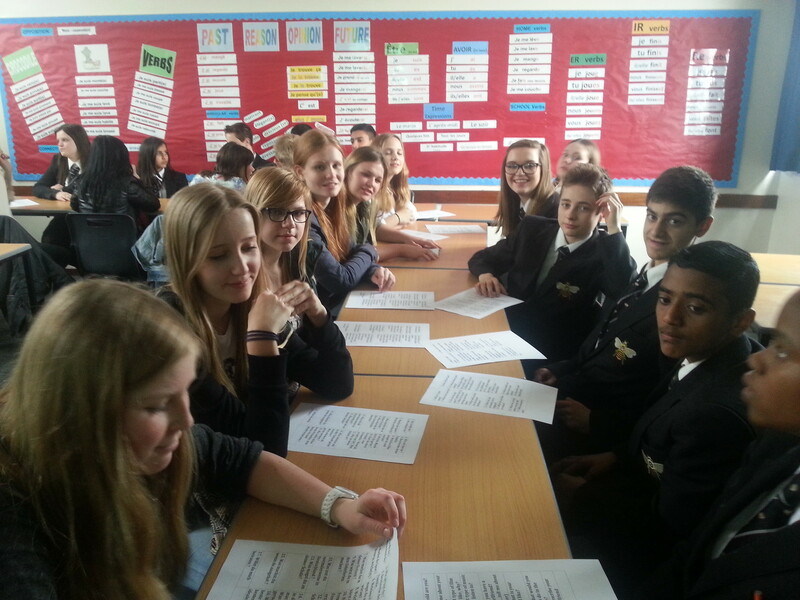 Then we had a speed dating lesson in which we had to ask questions in English and the English pupils had to ask questions in German. Suddenly the fire alarm rang and all the school had to leave the building, but it was only a drill. At 3pm we had to say good bye to our English exchange partners and went to the town centre and Luton’s shopping mall where we did some shopping. It was a great day. On the third day we woke up at 8’o clock and started with an awesome English breakfast with bacon, eggs, beans, muffins and sausages. After that we went back to London. When we arrived in the city, we took the underground to Camden Town where we walked around, shopped and ate something. Our group decided to have an English meal at the pub “Poppies”. We ate chips and chicken. 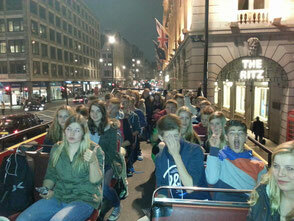 After that we met with the whole group again and took the tube to Oxford Circus. Our group went shopping again and bought delicious doughnuts and cookies. At 6pm we went - punctual as always - to our meeting point. We first took the tube, but it was absolutely crowded so we decided to walk to our sights. 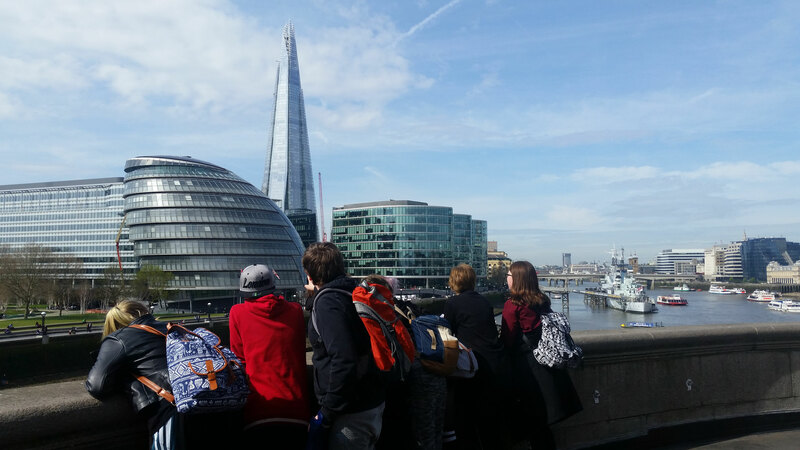 We went to St Paul’s Cathedral, the Globe Theatre, the Tower Bridge, Tower of London…After that we had to hurry because we wanted to do our London-by-Night bus tour. When we arrived at the bus stop we finally had the chance to sit down and enjoy the beautiful lights of London. After that tour we went back to our coach which drove us to Dover, where we took the ferry to Calais. It was an awful time on the ship, because it was shaking so much. When we finally had “earth” under our feet, we drove and drove. Shortly before we were home, our driver needed to make a break. We were so tired and just wanted to get home. We arrived at 11am in Olfen and ran into our families’ arms. We were happy to be home, because we were so unbelievably tired, but we had an absolutely wonderful time in England.